"... 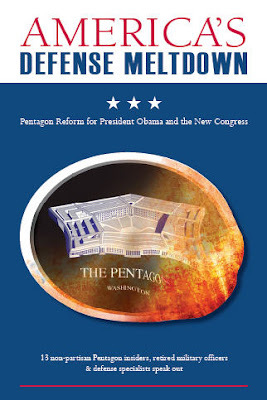 The mere notion of a “meltdown” within the U.S. military may seem ridiculous to many. America’s armed forces are surely the best in the world, perhaps even in history. Democrats and Republicans, liberals, moderates and conservatives in Washington all agree on at least that. On what basis does a bunch of lesser known, if not obscure, analysts make such a preposterous assertion? The vast majority, perhaps even all, of Congress, the general officer corps of the armed forces, top management of American defense manufacturers, prominent members of Washington’s think-tank community and nationally recognized “defense journalists” will hate this book. They will likely also urge that it be ignored by both parties in Congress and especially by the new president and his incoming national security team. America’s defense budget is now larger in inflation adjusted dollars than at any point since the end of World War II, and yet brigades than at any point in that period, our Navy has fewer combat ships and our Army has fewer combatthe Air Force has fewer combat aircraft. Our major equipment inventories for these major forces are older on average than at any point since 1946; in some cases they are at all-time historical highs in average age.